Amazing family home now available with Urban Property! This three bedroom detached property is situated in this popular residential area off Lorenzo Way and is perfect for a growing family and benefits from having a driveway to garage, en suite off the master bedroom and a secluded, established rear garden with beautifully planted shrubs, paved path and a raised decking area. Installed with gas central heating and double glazing throughout, this property briefly comprises of: Entrance hallway, downstairs W/C, spacious lounge, dining room and a modern fitted kitchen to the ground floor. The first floor provides three bedrooms (master with en suite) and a family bathroom. The exterior consists of an open plan, easy to maintain front garden and a fully enclosed rear garden with side gate entrance. DO NOT MISS THIS STUNNING PROPERTY! Entrance Hallway – UPVC double glazed front door, light point, radiator. Downstairs W/C – Light point, radiator, UPVC double glazed obscure window to the front aspect, low flush W/C, hand wash basin. Tiled splash backs. Lounge (4.2m x 3.9m)- Light point, power point, laminate flooring, radiator, UPVC double glazed window to rear, UPVC double glazed French doors to back garden. Dining Room (2.9m x 2.3m) - Light point. Radiator, laminate flooring, power points. UPVC double glazed window to front. Kitchen ( 2.9m x 2.4m)– Light point, power point, modern wall and base units with contrasting work surfaces, tiling to splash backs. Stainless steel sink & drainer with chrome mixer tap over, integrated electric oven & gas hob. Plumbed for automatic washing machine. UPVC double glazed window to rear, UPVC double glazed back door. Landing - with carpeted flooring and loft access. Bedroom One ( 3.5m x 2.8m) - Light point. Power points. UPVC double glazed window to rear aspect, radiator, laminate flooring. En suite – Light point, hand wash basin Shower cubicle, UPVC double glazed obscure window to rear aspect. Bedroom Two ( 2.7m x 2.8m) - Light point. Power points. Double glazed UPVC window to rear aspect, radiator. Bedroom Three ( 2.6m x 1.9m)- Light point. Power points. Double glazed UPVC window to rear aspect, radiator. Bathroom - Light point. UPVC double glazed obscure window to front aspect, wood effect tiled flooring, three-piece suite with panel enclosed bath, wall mounted hand wash basin and low flush W/C. 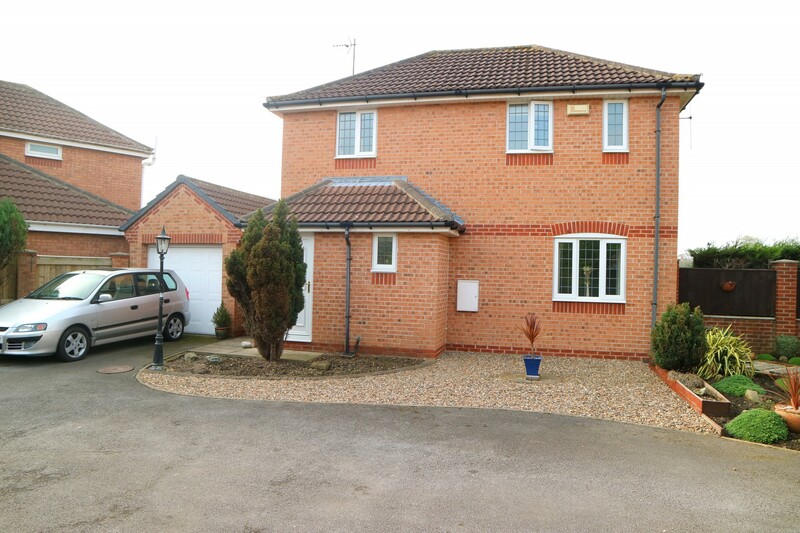 Exterior – Easily maintainable, open plan front garden with a drive way leading to the garage. Secluded, established rear garden with beautifully planted shrubs, paved path and a raised decking area.